This is Maracanã Stadium, Rio de Janeiro, Brazil. 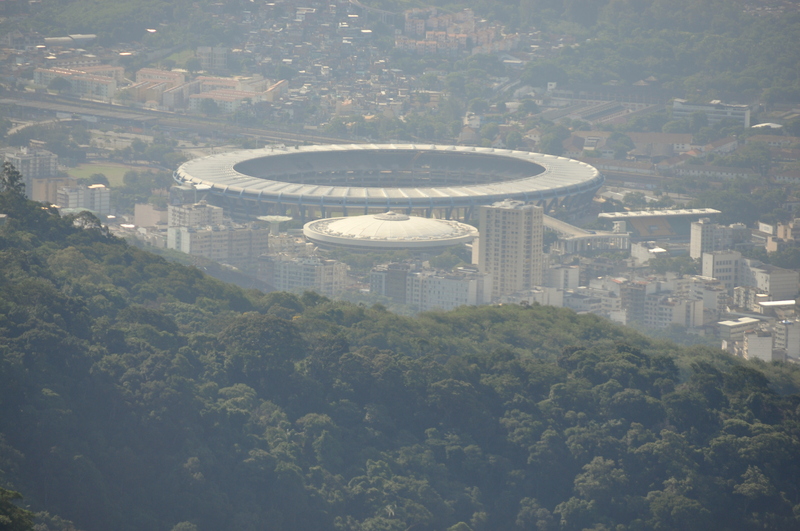 The picture was taken by yours truly in March 2011, on a rather hazy day from atop Corcovado Mountain. 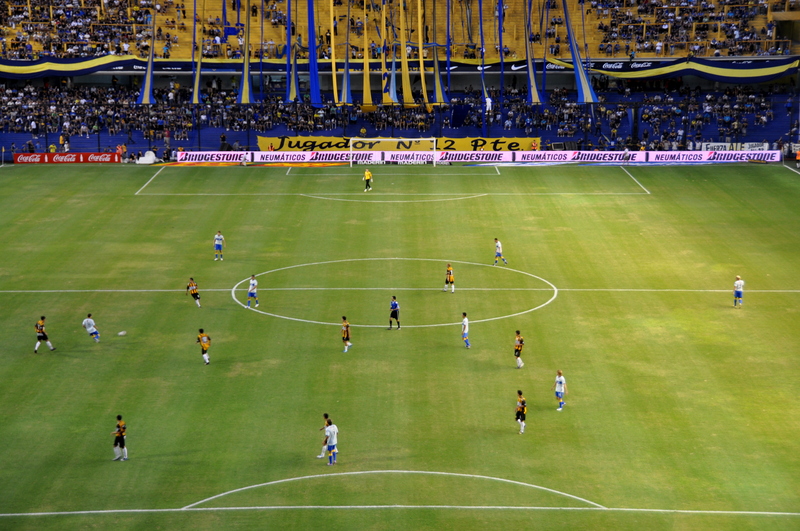 At that time, the stadium was closed for a three-year renovation in preparation for the mother lode of summertime sporting events: the 2016 Olympic Games and the 2014 FIFA World Cup. Those of you who know me well will agree that I’m not a big sports fan. About soccer – “football” or “fútbol” as it’s called everywhere else around the world except in the U.S. – I am particularly uninformed. I have attended just four professional soccer games in my life, and two of those were played when I was barely ten by the no-longer-in-existence Chicago Sting – one at the no-longer-in-existence Old Comiskey Park and the other at the no-longer-in-existence Chicago Stadium – and they hardly qualify as a result. The international traveler in me, however, has frequently shared hostel dorms with rabid soccer fans from around the globe. I noticed World Cup fever being exhibited while traveling through South Africa in 2009, and I even passed by their (under construction at the time) FNB Stadium outside Johannesburg. Additionally, two of my Eurotrek.net friends are season ticket holders and sit in the supporters’ sections at professional games for teams in their own cities. As such, I began to wonder what all the fuss was about. Later that same year, I was visiting friends outside New York City and one of them invited me to a New York Red Bulls game. One of my aforementioned supporters, he explained the rules: We stand, not sit. We proudly display the banner. We sing vulgar songs directed at the opposing team’s supporters’ section. It was a great time, and I finally saw what everyone else did: soccer is great fun! Fast-paced, low-scoring fun. I grew up in a baseball-loving home, but let’s be honest: a 0-0 or 1-0 soccer match is more fun than, say, a baseball game in which one team scores 13 runs. I also noticed – and not for the first time – that pizzerias and bars do great business whenever a game is televised. In Mexico, fútbol is essentially the national religion, and residents here can’t help but stop whatever doing to watch the game even when Mexico itself isn’t playing! I regret having never seen a game in person while living in Mexico City. One of my favorite bagel places is a small shop in Santa Monica. I spent several mornings/afternoons there over the last week, sipping my coffee and watching customers slowly file in to catch whatever game was being televised at that moment. Of course, the U.S.-Germany game this past Sunday attracted the largest crowd. Chants of “USA! USA! USA!” filled the air – not just of the stadium hosting the game, but of the bagel shop and, I’m sure, of bagel shops and coffee houses all across the country. Here in the U.S. soccer has finally earned the audience it deserves. Even though the U.S. lost this important game, as the 2014 FIFA World Cup enters its final week, I have little doubt that the remaining games will be Nielsen ratings champs. As for me: I don’t know if the reigning country will be Germany, Belgium, the Netherlands, Portugal, Costa Rica, Colombia, Argentina, or host country Brazil. However – and as is always the case – there were surprises along the way (Spain, anyone?) – and there may be surprises still to come. I have decided to root for the host country. Viva Brasil! Great post! Though I should probably point out that Portugal was eliminated in the group stage, but you forgot to mention France, which is still in the running. I think one of the amazing things about football is that it is truly international and democratic. Unlike hockey — Canada’s national religion — football doesn’t require expensive equipment, ice time, climate conditions… It can pretty much be played anywhere there’s a ball and a patch of grass. It’s the world’s biggest party. And even though we never* qualify or even come close, Canadians in recent years have embraced the World Cup with fever, cheering on teams based on cultural alignment, heritage, or sheer randomness. *Nb. Canada did qualify, once. In 1986, we lost three straight matches to be eliminated in the group stage. I was 6 years old. No, I don’t remember it. Thanks for reading. Pobre Mexico.